It seems incredible to me that, with all the other things happening simultaneously at the Disney studio in 1938–39—three feature-length films, one of them involving a massive and unprecedented experiment in sound recording, along with a full slate of short theatrical cartoons—the artists also found time to produce two commercially sponsored cartoons. But they did. One was The Standard Parade for 1939, shown at the Standard Oil sales conventions in that year, which I’ve already documented in an earlier installment of this column. 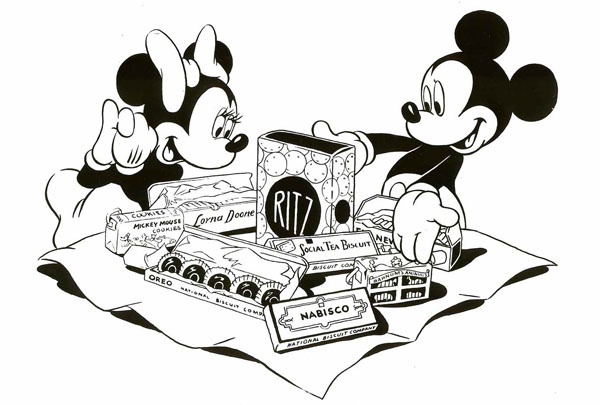 The other was Mickey’s Surprise Party, a commercial short advertising Nabisco products, which was shown at the New York World’s Fair in 1939–40. For years this short was practically unknown, overshadowed by the many Disney classics dating from the same period—and likely confused with the similarly titled Mickey’s Birthday Party, a theatrical short released in 1942. 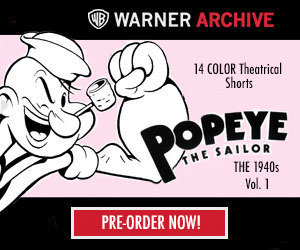 But in more recent years the Nabisco short has become something of a cult favorite. It has an intriguing novelty value, and moreover is quite lavishly produced, marked by the same visual luxury that distinguished many of the studio’s theatrical releases during these years. That, indeed, is one of the most fascinating things about it. 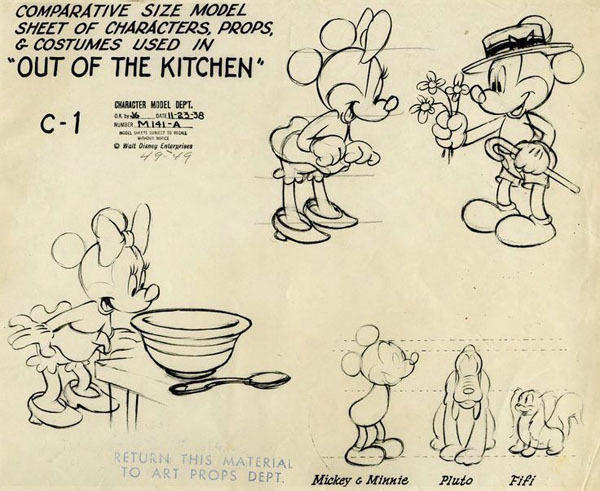 The Disney studio contracted in the summer of 1938 to produce this picture, and by late August a story outline, bearing the working title “Out of the Kitchen,” had been prepared. Its basic situation, Mickey and Pluto paying a visit to Minnie and Fifi, has an unmistakable resemblance to the 1933 classic Puppy Love, but now a new story element has been added. 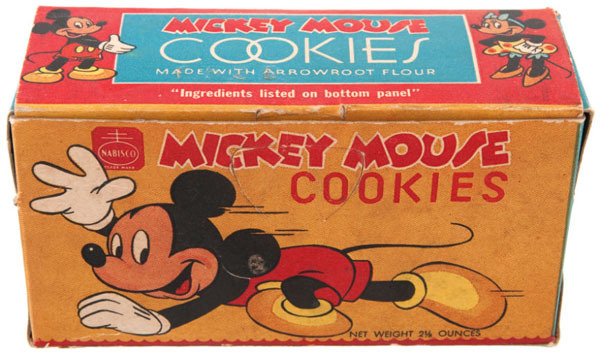 Here Minnie attempts to bake Mickey some cookies “like your mother used to make,” but is distraught when she burns the cookies—giving Mickey an opening to save the day by purchasing a generous assortment of Nabisco products. Starting with this slim premise, director Paul Satterfield worked with a story crew for months. Dave Hand sat in on some of their meetings, examining story development with a critical eye and offering suggestions. By late October the animators were at work on the picture. A quick glance over this credit list is revealing, in several ways. The Disney fan will see familiar names here, talented animators all. 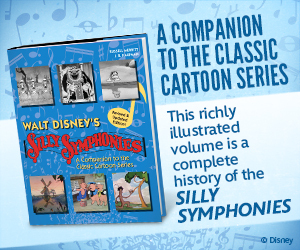 Two of them, John Lounsbery and Ollie Johnston, would go on to establish themselves among the “Nine Old Men.” In the fall of 1938, however, both of them had yet to attain that status—and, in fact, at that time none of the artists in this list were considered among Disney’s first-string animators. Among other things, this demonstrates just how accomplished the second-string animators were! 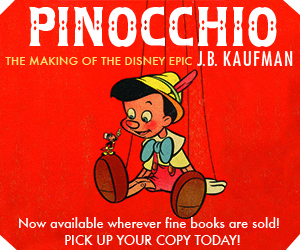 The studio’s star talent was reserved at the time for Pinocchio, the feature that would become Fantasia, and other high-priority projects. But Mickey’s Surprise Party was no throwaway. On the contrary, it was produced to be shown at the World’s Fair to an audience that would number, collectively, in the millions. That high-visibility showcase called for a film that would maintain the prestige of the Disney name. Accordingly, this half-reel advertising short was produced with meticulous care. Between November 1938 and January 1939, it was subjected to no fewer than twenty sweatbox sessions in which Satterfield and others scrutinized the animation in minute detail. Dave Hand, viewing Harvey Toombs’s animation of Minnie tasting the cookie batter, directed him to “Get a pause on Minnie and then start out. Give her more time to put over the tasting idea. If you add the pause, it puts over the idea that she has to remember something else.” Effects animator George Rowley, assigned the character animation of the fish in the closeup of the fishbowl, was told: “When the fish is up at the top in his scramble action, have the tail wriggling back and forth for more frantic feeling. Just before the fish gets to the hit you slow your timing up. Speed this up.” These and other details were parsed as painstakingly as if for a feature. Two of those sweatbox sessions were of special note. Early in November 1938, Fred Moore, who had become the studio’s recognized Mickey animation guru, sat in the sweatbox with Hand and Satterfield for nearly four hours, reviewing the animation to date. Moore critiqued individual scenes, offered suggestions, and in a few cases volunteered to rework the scenes himself—essentially performing the same function he did for The Sorcerer’s Apprentice and other Mickey-centric productions. Six weeks later, in mid-December, Moore attended another sweatbox meeting, along with Norm Ferguson, who exercised a similar authority over Pluto, and Ham Luske. This time, all three “star” animators weighed in with their advice on the work to date. In this way, Mickey’s Surprise Party did benefit from the studio’s top tier of animation talent. All this careful attention resulted in the lovingly crafted film we see today. Every period in Disney animation history has its own distinctive qualities, but the late 1930s in particular are marked by a lush pictorial sumptuousness that is a pleasure to the eye. Mickey’s Surprise Party is enhanced by such trimmings as DX shadows, rich color modeling, and Minnie’s glistening teardrops. Among other points of interest, it offers an extended animation performance by Walt Kelly—the same Walt Kelly who would later become legendary as the creator of Pogo. 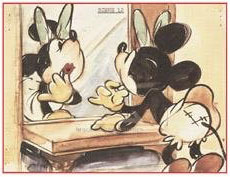 Attentive Disney fans will note that Kelly’s scene of Minnie primping at the mirror was reused in Mickey’s Birthday Party several years later, after Kelly had left the studio. 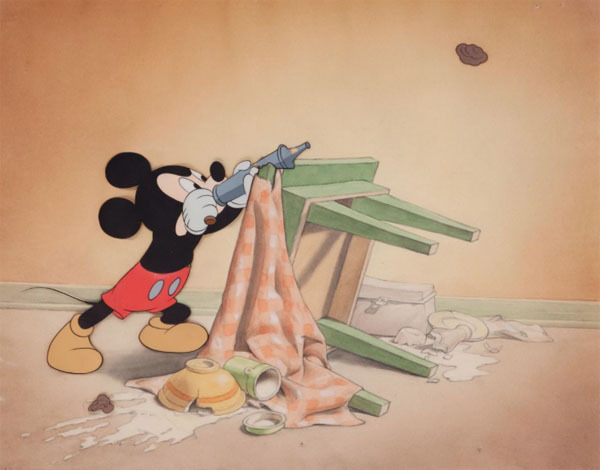 The famous graphic redesign of Mickey and Minnie, featuring eyes with pupils, was created by Fred Moore late in 1938 while this short was being planned. Ultimately Mickey’s new design would be “officially” unveiled in The Pointer, released to theaters in July 1939. But long before The Pointer’s release, Mickey’s new look was being previewed—in the Mickey Mouse newspaper comic strip, and on the screen in specialized uses. I’ve already written about The Standard Parade, which displayed the “new Mickey” as early as March 1939 to an unlikely audience: Standard Oil salesmen. Mickey’s Surprise Party—shown at the World’s Fair, which opened at the end of April—similarly anticipated The Pointer by several months. Today, with its rich visual luxury combined with Mickey’s unusual role as a commercial spokesman, it’s a delightfully unique delicacy for the Disney enthusiast. My favorite Mickey Mouse cartoon!I can never get tired of watching it.thanks for posting! This was reedited in The Spirit of Mickey video I remember watching. What is a DX Shadow? DX is short for double-exposed. The shadow was painted solid black on a separate cel, and then the scene was photographed twice — once, in a partial exposure, with the shadow in place, and again, completing the exposure, without the shadow. It was more work for the painters and camera crew, but it made a nice, convincingly transparent shadow. Can this be found on a Disney DVD? Yep, the Walt Disney Treasures line (Mickey Mouse in Living Color). Yes. It’s an Easter egg on disc 2 of the Walt Disney Treasures set “Mickey Mouse in Living Color: Vol. 1.” You can find it on the main menu. I can only repeat everyone else’s comments and say that this cartoon is a nice extra treat from the theatrical era, not a TV commercial! I enjoyed this as much as I would enjoy any Disney classic cartoon of the same era, and I wondered whether other studios ever did this with their characters. Imagine if MGM were to do this with some of their classic characters, and Hugh Harman and Rudy Ising would go on to do public service cartoons well after their HAPPY HARMONIES and MGM golden days. I remember seeing a version of this where they removed the explicit Nabisco references, showing “generic” cookie packages. Guessed it was for commercial release. If there was such an animal, what’s the story? I remember seeing this on The Spirit of Mickey VHS tape I had as a kid. I still think it’s charming.